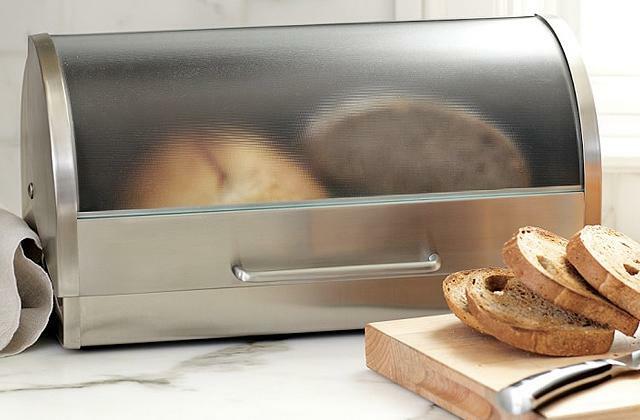 The model comes with 5 shelves that will allow you to store up to 60 jars in total. The aluminium rails keep the jars in place and make sure you don't accidentally knock one when you grab the other. The rails aren't susceptible to scratches or corrosion. The screws that come with the package are a little short. 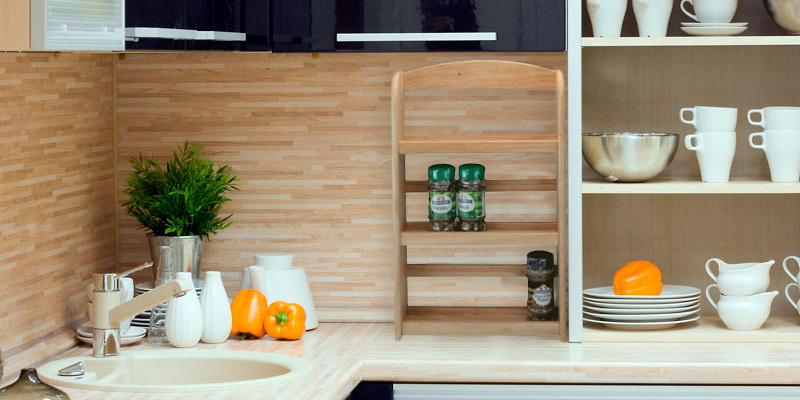 This wooden spice rack from SilverAppleWood is great for people who love cooking, for people who would like to expand their culinary horizons, and for people who enjoy experimenting in the kitchen and showcasing their cooking skills. For others, it might be an overkill. The rack is made of carefully-selected hevea wood. It is hard, stable, and has a naturally high resistance to warping. Furthermore, it is really easy to maintain. It doesn't absorb water. You can just wipe the shelves with a damp cloth and that should be enough to keep the rack in a good condition. The round little front pieces bend easily. 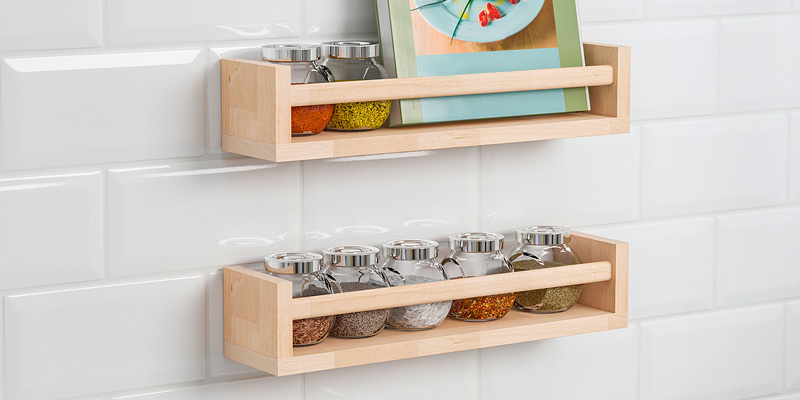 T&G Scimitar is great because this wooden spice rack is as stylish as it is practical and functional. 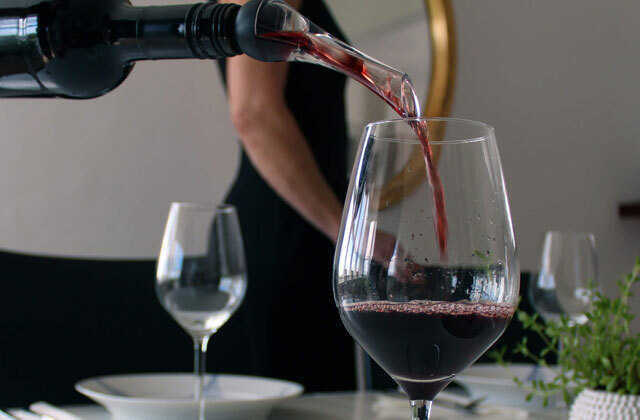 You can put it virtually anywhere you want. It is not demanding in terms of maintenance whatsoever. Plus, it doesn't hurt that the model looks pretty good too. You can use the rack as a book holder. Crafted from premium birch wood, you can sand, lacquer, and paint these shelves without worrying about damaging the rack. You can install it in any room you want. It might take you some time and effort to put the whole thing together. 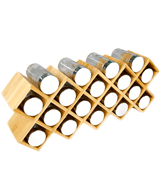 IKEA BEKVAM Wooden Spice Rack represents everything that IKEA furniture is all about: the price is attractive, the minimalistic Scandinavian design is efficient and, for the most part, practical enough, and you will have to break a little sweat to install it. Rubberwood doesn't darken with time when subjected to UV lights on a daily basis. You can use the rack as a tabletop model or wall-mounted. There's a little more space between the shelves, making the rack suitable for taller jars. There are no holes or hooks to hang it, so you'll have to drill into the wall. Apollo RB is a smart, space-saving storage solution. The price couldn't be more affordable. The rack is as durable as it is reliable in the long run. Plus, its edges are rounded, making the model about as safe as a wooden spice rack can be. The glass jars come with chrome-finish lids and self-adhesive spice labels. The lids work wonders keeping the spices' aroma and flavour intact. The self-adhesive spice labels will allow you to immediately find and identify the right jar. The small holes in the cap don't fit larger spices. The model incorporates a contemporary, sophisticated design, with diamond-like separate openings for each and every jar. It looks gorgeous. Though the package isn't cheap, the price makes sense considering the 18 quality jars that come with the rack. 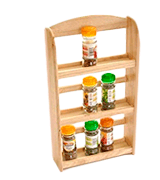 You don't go with this solid oak spice rack from SilverAppleWood if you don't really cook all that much. Sure, complemented with brushed aluminium rails, the model looks great. 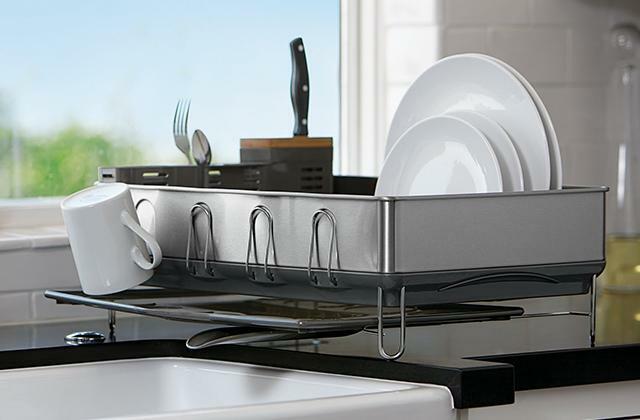 Though it doesn't necessarily seem like it, this not-so-little storage solution will fit modern kitchens about as well as it does contemporary and traditional kitchen settings. 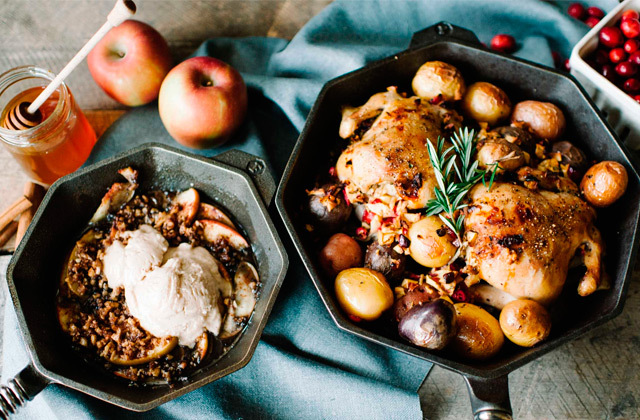 The problem is that you'll hardly be able to put it to good use if you're the type of person who cooks once a week. 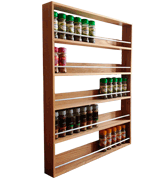 With 5 shelves that will allow you to store up to 60 jars in total, this wooden spice rack is reserved for spice buffs, cooking enthusiasts, professional chefs, gastronomy aficionados, etc. 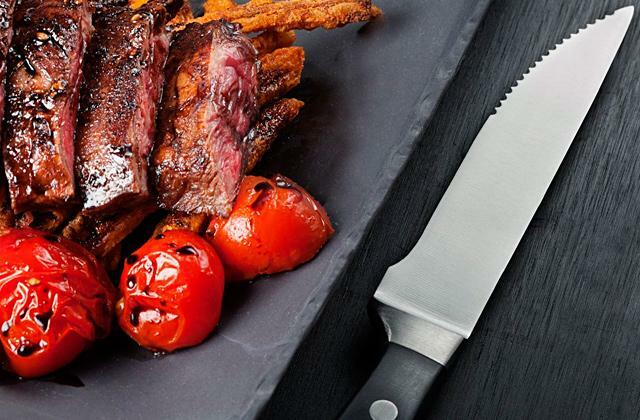 You don't have to be a skilled cook but you do have to have a passion for it, otherwise, the model is an overkill. The whole thing adds up to 56 x 73.5 x 7 centimetres in overall dimensions, so you will probably have to free up some space for it. Fortunately, the supplied fixings will allow you to mount it onto a wall or a door, so you do have different placement options. That being said, we would recommend purchasing the screws separately because the ones that come with the package aren't very good. 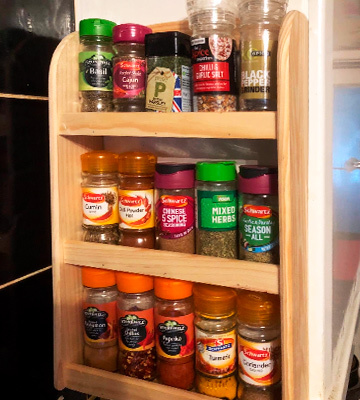 Once more, this wooden spice rack from SilverAppleWood is great for people who love cooking, for people who would like to expand their culinary horizons, and for people who enjoy experimenting in the kitchen and showcasing their cooking skills. For others, it might be an overkill. 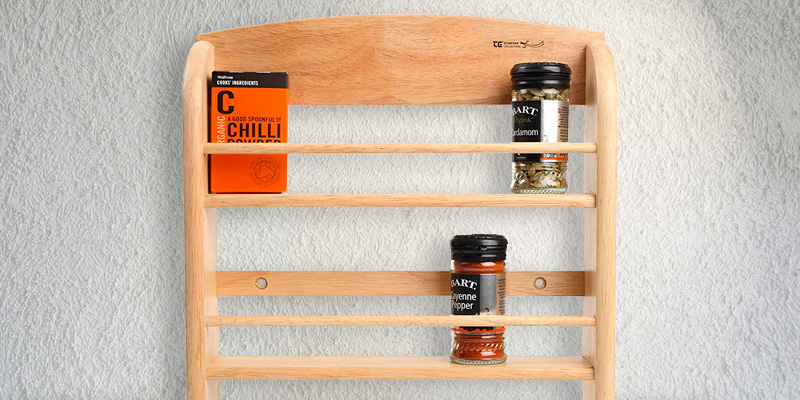 T&G Scimitar is a lovely little spice rack, as stylish as it is functional. With it, you'll be able to store and display no less than 18 jars of your favourite spices and herbs. It doesn't necessarily look that much different compared to your average rack like that. That being said, the model has a thing or two going for it that separates it from that average rack. 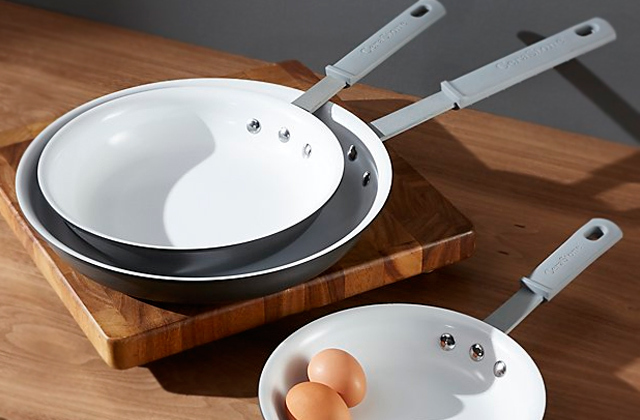 First and foremost, it is made of carefully-selected hevea wood. It is hard, stable, and has a naturally high resistance to warping. Furthermore, it is really easy to maintain. You can just wipe the shelves with a damp cloth and that should be enough to keep the rack in a good condition. Now, as for that functional part, we really like the front-facing guard rails that hold the jars in place. What we don't like, however, are these round little front pieces because they bend too easily. Other than that though, the model is about as practical as they come. You can use it in a free-standing position. You can attach the rack to a wall or a cupboard. 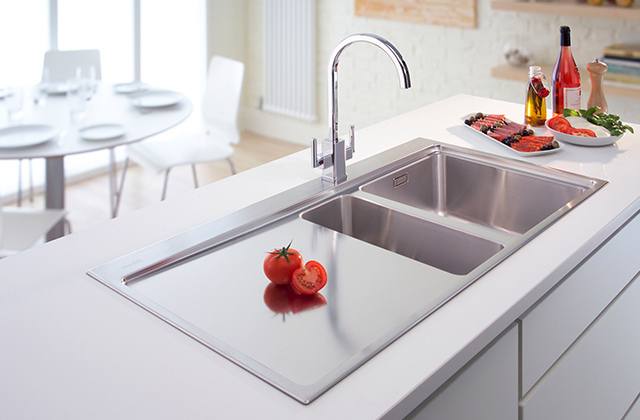 There isn't a surface that will not suffice, especially considering that the fixings that come with the package are particularly sturdy and reliable. 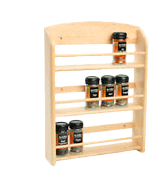 Again, T&G Scimitar is great because this wooden spice rack is as stylish as it is practical and functional. 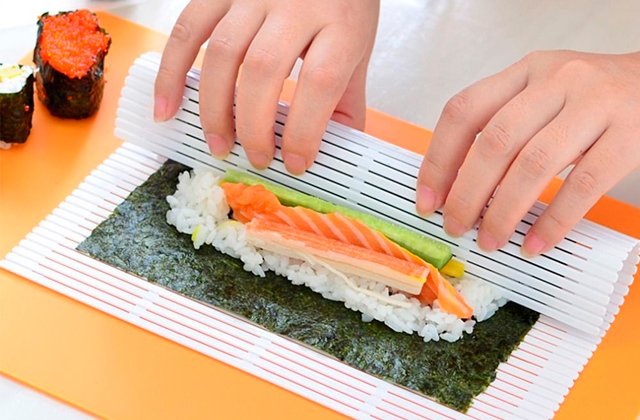 You can put it practically anywhere you want. It is not demanding in terms of maintenance whatsoever. Plus, it doesn't hurt that it looks pretty good too. As it is usually the case with IKEA, BEKVAM is about as minimalistic as they come. All we're dealing with here are 4 separate wooden racks, each equipped with a wooden rail that keeps the jars nice and tight. There's nothing particularly interesting about this model and we don't mean it in a bad way. Because it is so simple and minimalistic, you can just as well use it as a book holder or, well, any other holder for any other group of household articles. Though the shelves do not necessarily look all too appealing, they're made from premium birch wood, meaning you can sand, lacquer, and paint these shelves without worrying about damaging the rack. The only thing that's not simple about this model is installation. Then again, it is always the case with IKEA, isn't it? It might take you some time and effort to put it together but you should be able to figure it out. As you can probably tell from the pictures, this isn't a tabletop model and you will have to mount it to a wall. 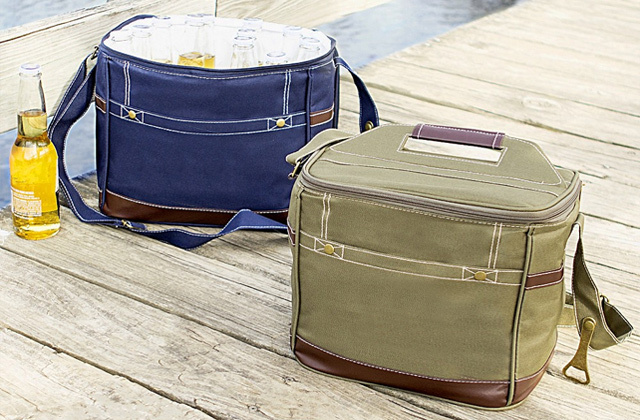 You'll also have to grab your tool belt because the package doesn't include mounting hardware. 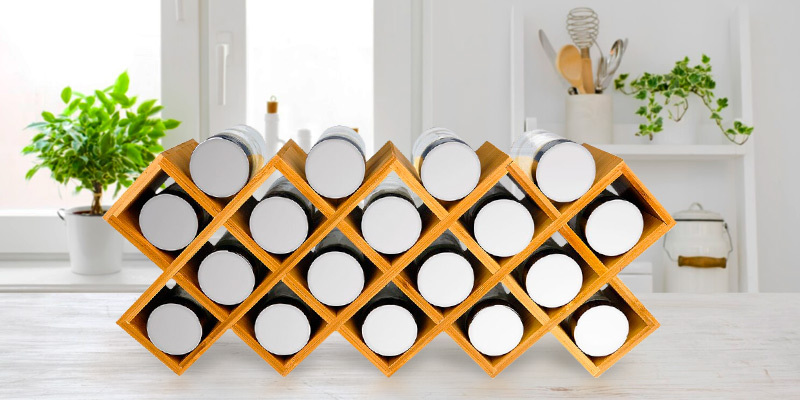 All in all, IKEA BEKVAM Wooden Spice Rack represents everything that IKEA furniture is all about: the price is attractive, the minimalistic Scandinavian design is efficient and, for the most part, practical enough, and you will have to break a little sweat to install it. There is a lot to like about Apollo RB. For starters, it costs less than 10 quid right now, so the price is nothing short of modest. With budget racks, the issue is usually subpar timber. However, that isn't the case here. Rubberwood is anything but subpar. 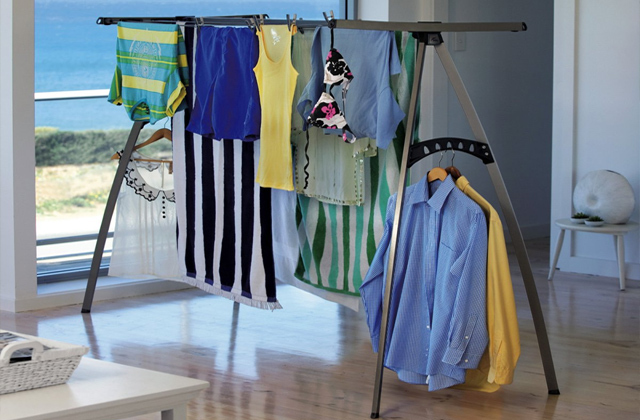 It does not absorb water, meaning you can wipe the shelves with a damp cloth without damaging the rack's integrity. It isn't immune to UV light but it doesn't really darken with time when subjected to it on a daily basis either. Last but not least, rubberwood isn't the most attractive type of wood out there but, for our taste, it is far from unattractive either. Apart from that, there's nothing particularly different about this rack. It measures 24.5 x 44 x 7.5 centimetres in overall dimensions, meaning the model is neither too large nor too small. 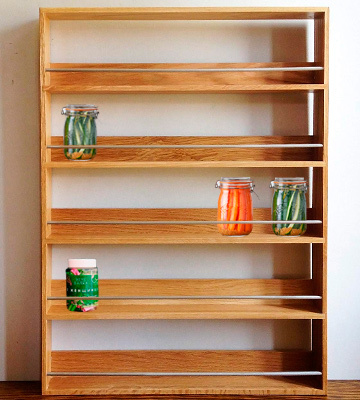 Its 3 shelves will allow you to store up to 15 jars, a solid spices and herbs collection. The usual wooden rails will keep those jars from falling. You can use the rack as a tabletop model or wall-mounted. That said, there are no holes or hooks to hang it, so you'll have to drill into the wall. Bottom line, Apollo RB is a smart, space-saving storage solution. The price couldn't be more affordable. The rack is as durable as it is reliable in the long run. 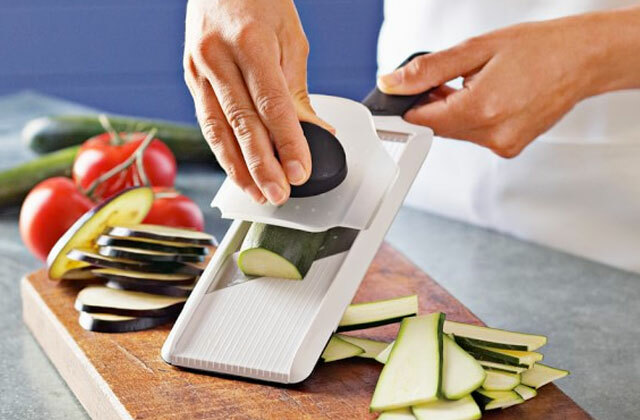 Plus, its edges are rounded, making the model about as safe as a wooden spice rack can be. 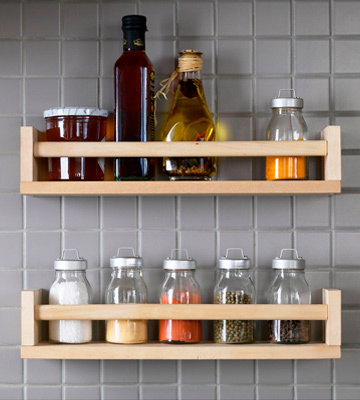 Harcas, with this particular model, doesn't go the usual route, presenting you with a traditional, boring spice rack. Instead, the model incorporates a contemporary, sophisticated design, with diamond-like separate openings for each and every jar. It looks gorgeous. It isn't just a practical, space-saving storage solution. 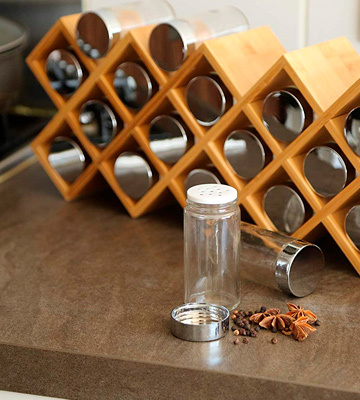 No, this wooden spice rack will be able to add character to any kitchen. Sure, the price is hardly modest. But keep in mind that the company doesn't just supply you with an admittedly attractive rack. In addition to it, the package includes 18 glass jars with chrome-finish lids and self-adhesive spice labels. As you can imagine, these jars perfectly fit the rack's openings. The aforementioned lids work wonders keeping the spices' aroma and flavour intact. 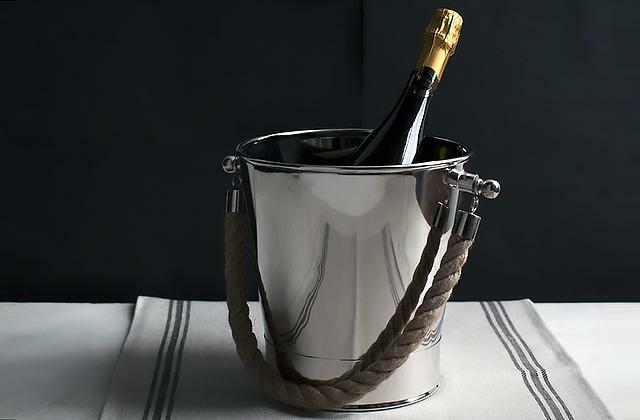 Plus, they look about as elegant and refined as jars can look. Needless to say, the self-adhesive spice labels will allow you to immediately find and identify the right jar. The only issue we have with these jars and the package in general is the holes in the cap. Because they are really small, you might have some issues with larger spices. 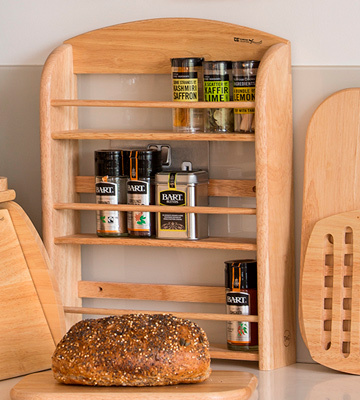 Simply put, in some ways, this wooden spice rack from Harcas is less convenient and practical than your average rack like that. In others, it is a lot more convenient and comfortable to work with. 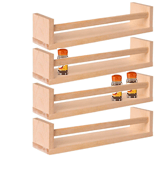 However, you cannot argue that the model looks better and much more interesting than a traditional spice rack. What Is a Wooden Spice Rack? There are so many different spices out there that you can't really put a label on them as a whole. Having said that, in general, spices are great for you. Different spices have many different health-promoting properties. Some are able to improve digestion, stimulating motility and enzyme production in your gut. Certain spices have excellent anti-inflammatory properties. Some are packing powerful antioxidants, while others can help with appetite control. But it isn't just about the health benefits. One would argue that, first and foremost, we use spices because they allow us to add flavour to any meal and change it in so many different ways that you'll hardly be able to recognise it afterwards. Bottom line, you can't have too many spices in your kitchen, provided you have a nice wooden spice rack to store and organise them. 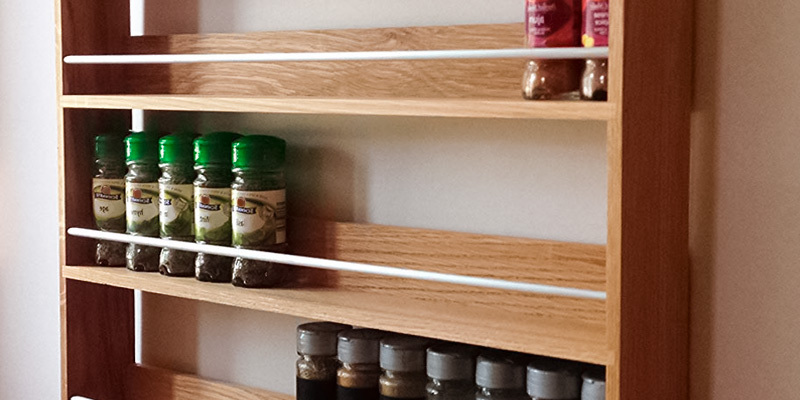 With one of these racks, you'll be able to keep many different spices at hand, showcase your cooking skills, and expand your culinary horizons. Just make sure you have enough space for the rack and you're good to go. A new spice grinder will work very well together with one of these racks, so you might want to consider one of these models too. On a different note, going the organisation route, a new dish rack certainly wouldn't hurt.